The Fifth Estate’s Flash Forum started with a speedy overview of the housing market by SQM Research property analyst Louis Christopher, explaining why there’s no evidence of a slowdown. Following is an edited transcript of his presentation. My first question. Is there a slowdown happening in the market right now? There’s been a lot in the media about that, certainly in the past three to four days. In my view: no way. One of the first things I like to look at in terms of leading indicators are auction clearance rates. Sometimes there’s flaws in the series but overall I have found in my career that they have provided a very good indicator of turning points in the market. So if there was a slowdown in the market the first thing we would be seeing is a clear drop off of auction clearance rates, or a rise in unreported rates where agents become a little reluctant in reporting bad news. 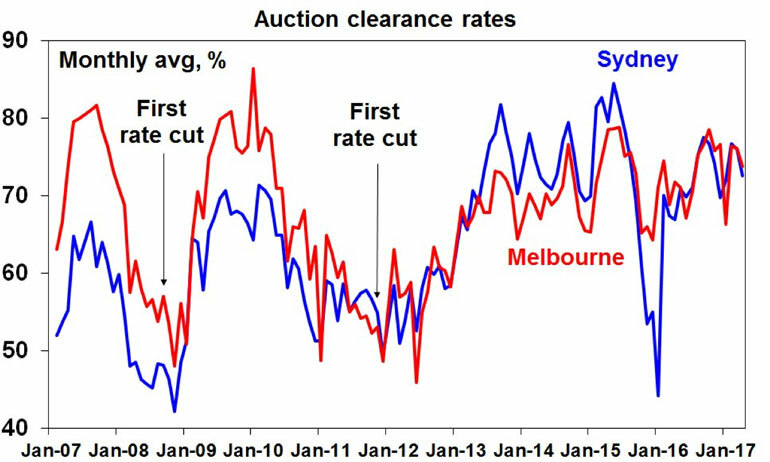 We are not really seeing either at this point in time and I’d just like to point out that last weekend the auction clearance rate in Sydney was circa 80 per cent and it was the same with Melbourne. I would prefer that auction clearance rates fall down to the 60s or certainly below the 70s in a clear downward trend before I say hang on, somethings going on here. As you can see – note the lows and the highs – I think the all-time low we had was in 2004 when we had that vendors stamp duty come in and the auction clearance rate in Sydney was 33 per cent that year. So that just gives you an idea of the range. Okay, now one of the other factors I like to follow is asking price. 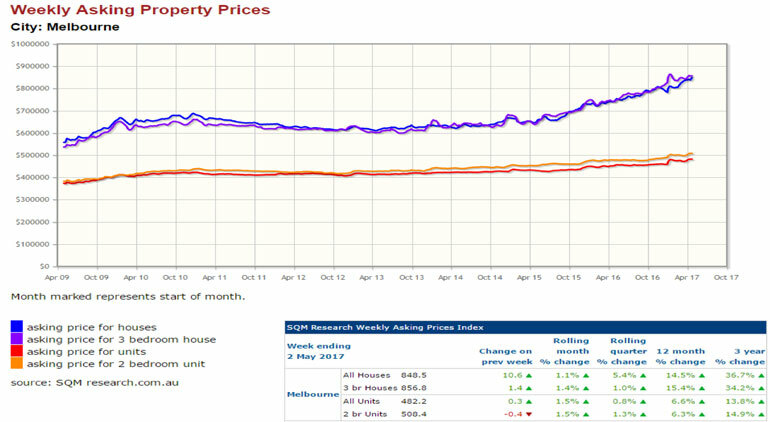 And you may say well, that’s vendors, but I’ve actually found that to be rather sensitive to market conditions and there appears to be a very good correlation between our asking prices series and the [Australian Bureau of Statistics’] stratified series, [Australian Property Monitors’] stratified series. We note that over the last month for Melbourne we recorded a rise in asking prices for houses by 1.1 per cent and for units about 1.5 per cent. 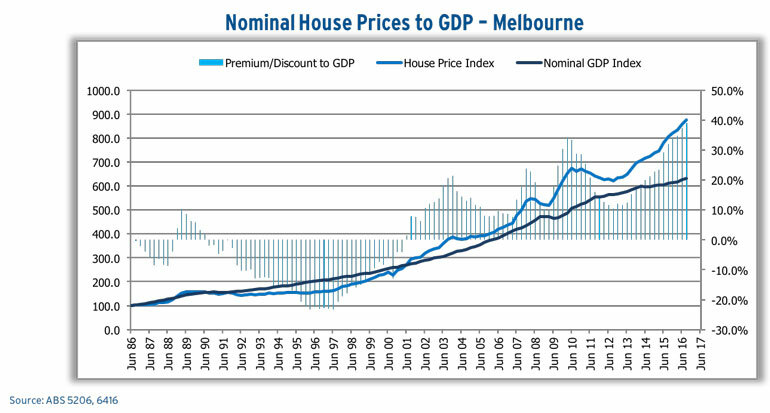 We are not at this stage in Melbourne recording any type of flattening of this particular chart. Here is Sydney. So the asking price we have now, and this is for predominantly a free-standing house, $1.369 million. It’s very high for the asking prices at this point time. We had them up 2 per cent for the month and we’ve got them up 15 per cent for the past 12 months. One of the measures we like to look at when understanding fair value is prices compared to nominal GDP. So here is the view we have: prices cannot move beyond nominal GDP growth rates forever. They can’t raise faster than nominal GDP forever, for an accelerated growth rate. The reason being is that means effectively you are taking up more debt and your servicing levels start to increase. Now that can happen for a long period of time, particularly in a cycle of lower and lower interest rates. 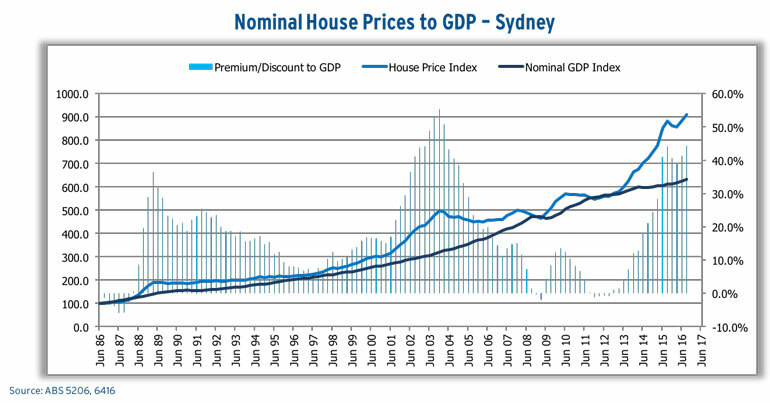 What this chart actually illustrates in Sydney is the bar lines represent how much of a premium prices run up against nominal GDP. Now the worst point or most overvalued point on our numbers was actually back in late 2003. And for those who follow the markets closely you would be aware that in 2004 there was a mini-correction in the Sydney market. Of late our numbers show that the market is now at its second most overvalued point since the 1980s. Now Melbourne is not as overvalued as Sydney but I would like to point out that, on our numbers and in our view, Melbourne is at its most over-valued point ever recorded. So the market has certainly accelerated away compared to incomes. And I do believe the market is also very susceptible to any type of major interest rate rise in Melbourne. I’ve been asked to put together some prices comparing Sydney versus other cities, and I’ve randomly chosen these – there’s a lot more cities than this of course, but I’ve just tried to pick first world cities. We have Sydney here at $1.15 million. The most expensive we have is actually San Francisco at 1.5 million. We have Hong Kong at 685,000. It gives you some perspective in terms of some of the world cities. Sydney is definitely right up there, there’s no question about that, but the question I put forward for tonight is: is Sydney becoming more internationalised? Are our prices becoming more aligned with other capital cities worldwide? And looking at the evidence we are kind of moving a little bit ahead on the number of the first world cities. Not the most expensive, but getting there. Of course, keep in mind these are absolute numbers. You need to really take into account land size, price per square metre – they are all critical as well. Here are some income multiples, so just looking at the relative multiples there. Hong Kong being the most expensive when you look at incomes, Sydney is up there at 12 times, the cheapest we’ve got there is Chicago at 3.8. I’m not so sure you’d want to live in Chicago right now. So sometimes there’s a reason for the season and one of the things I would put forward as well in terms of valuation is that Sydney is like a very high-earning stock – a share. 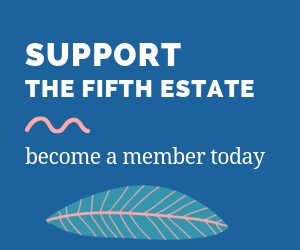 Think of shares in trade on a high [price to earning] multiple. Often they trade at a high P/E multiple for a very good reason, and Sydney’s got a lot going for it when you think about it. 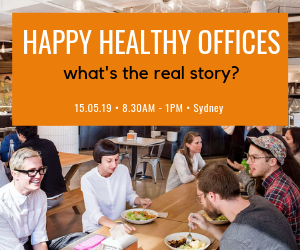 A great economy, a great lifestyle, a lifestyle that really many in the world would envy – potentially that is one of the reasons why Sydney has become so expensive over time. 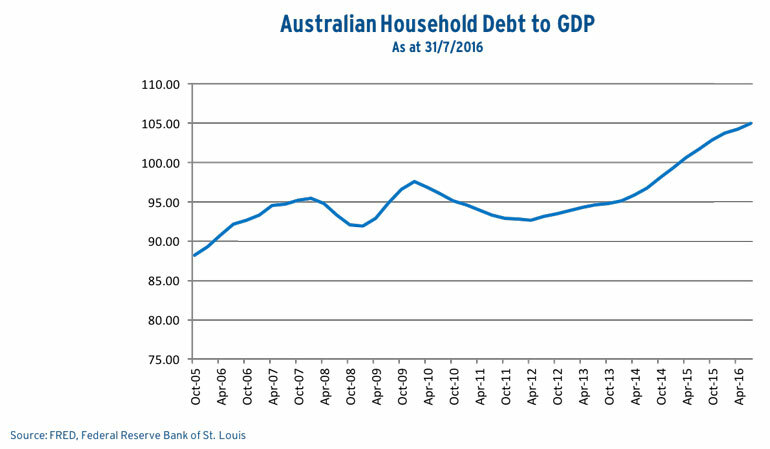 But there is the bogeyman as well, and that is household debt to GDP. We have reached new levels. And that’s been driven by large increases in housing finance approvals over the last few years, and it does mean that the market is susceptible to any aggressive interest rate rise. 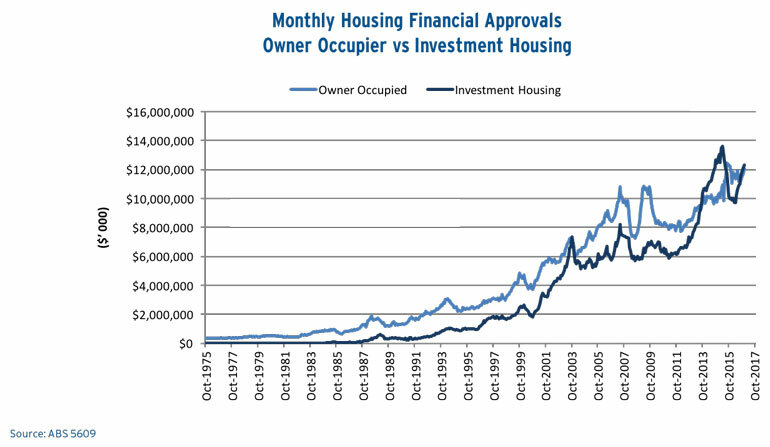 Here is the data showing housing finance approvals – owner-occupier versus investment housing. You can see in recent times, the two have converged a little in terms of absolute dollars. 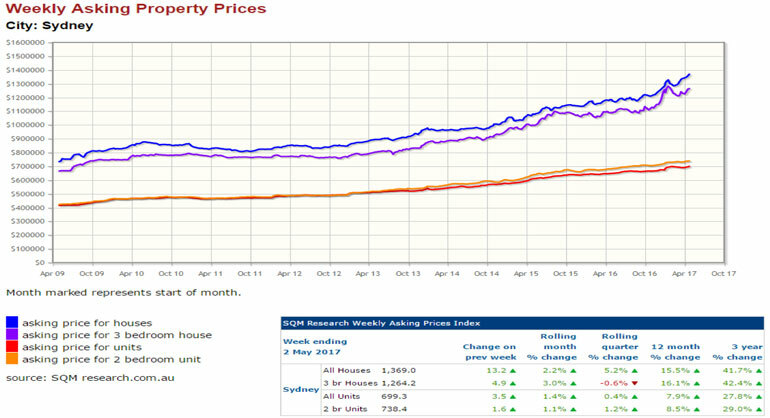 There’s been strength in recent months – the last 18 months at least – with both owner-occupier and investor housing. I would argue that in the first part of this recovery turning into a boom say 2013, that was more so driven by owner-occupiers, investors then came into the market, and drove the market, and now it seems to be fairly equal. Why have we reported strong owner-occupier lending though? And I think this is one of the things we need to consider in this whole debate. We are having very strong population growth. So this is the state-by-state split of annual population growth numbers. The top line there – the [dark] blue line – is Victoria. They are now expanding by over 120,000 people a year. That’s effectively greater than the size of the MCG each and every year. For Sydney we are basically circa 100,000, just under, each and every year. That underlying demand just keeps getting stronger and stronger. 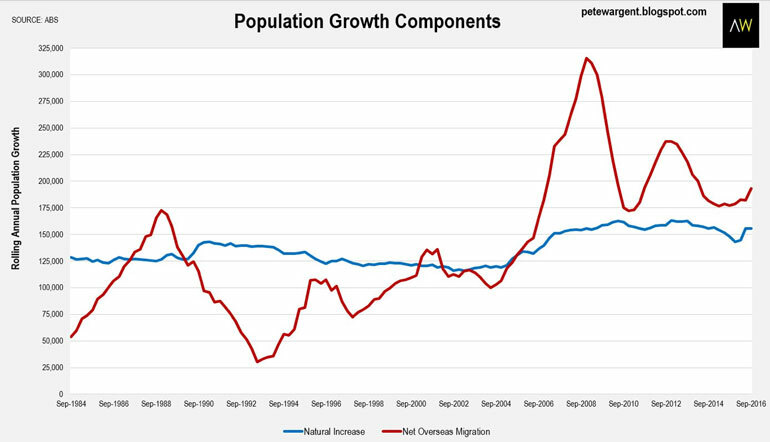 Here is a breakup of the natural population increases, which is the blue line and the net overseas migration which is the red line. See the spike we had just after the GFC. It’s come back down again for migration, but now it’s just under 200,000 people per annum. 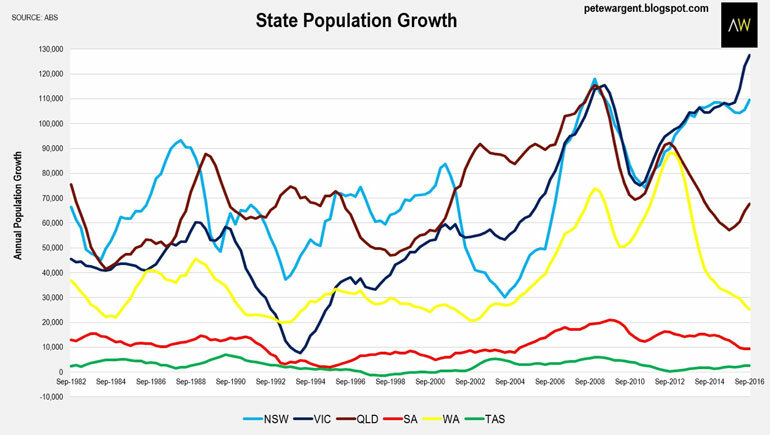 So we are getting very strong population growth rates continuing. So Melbourne is rising now at 2.4 per cent per annum, and if I recall the Sydney number it’s about 1.7 per cent per annum in terms of the actual expansion. They are very strong numbers. If I recall Melbourne is now growing faster than Brisbane. 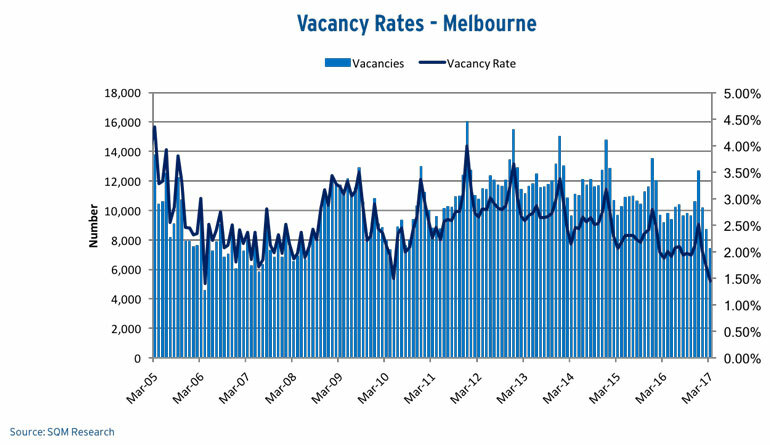 This has meant that vacancy rates, despite the fears of oversupply, have not really materialised but for perhaps a couple of pockets. We know that in Brisbane there is an oversupply problem for sure. Fears of oversupply in Sydney and in Melbourne have not yet materialised – not in any great way yet. 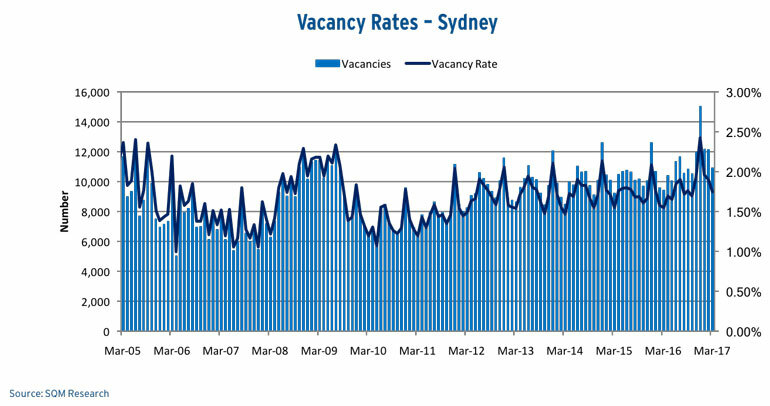 When I look at our vacancy rate chart you can see for Sydney it’s still pretty steady – still under two per cent and there’s no really great rise appearing at this point in time. Melbourne is actually trending down. So despite the increase in dwelling supply, that stops being absorbed by the rampant increase in population. I think there are other factors going on as well. I note Airbnb said they had 44,000 listings now. That’s a lot. That’s a lot that would probably have been in the regular rental market and perhaps there’s this notion of new properties perhaps not making the rental market. It’s hard to get quantifiable date there. I know Prosper tried to have a go through water usage. I think we need to do some further investigations on that data. But potentially there is an issue there. Certainly enough for the Victorian state government to take some action and perhaps we might see something from Scott Morrison next week on this. 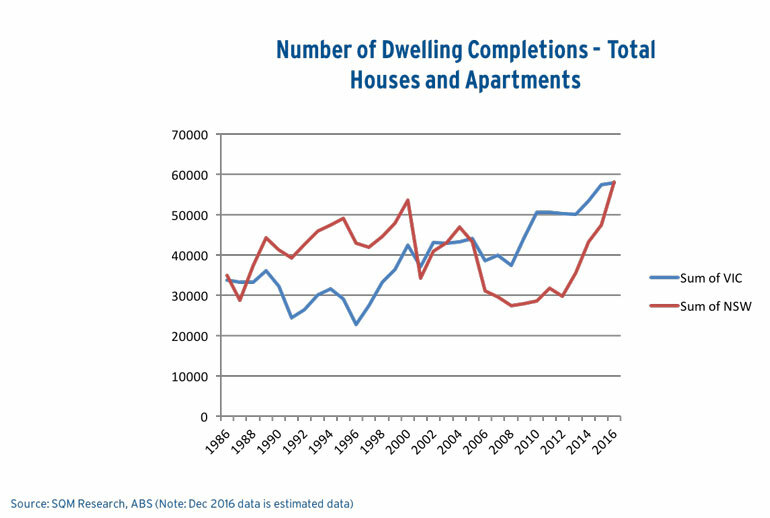 Here’s the total number of dwelling completions – apartments and houses some in Victoria and some in NSW. Note: we have definitely had an increase. So it’s there. The numbers are there. The vacancy rate is not going up. 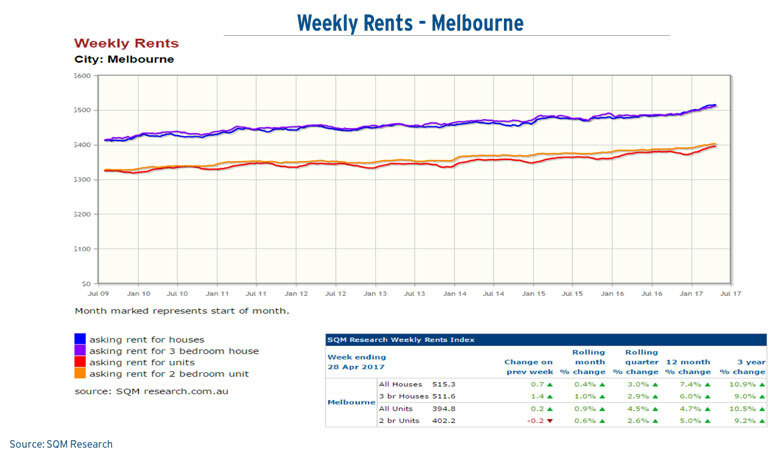 So we measure asking rents, and I think most of my peers do as well – so when you see the Core Logic rents they are basically asking rents; when you see the APM rents they are asking rents as well – and on our numbers for Melbourne for houses, we are recording rental increases of seven per cent in the last 12 months. And for units 4.7 per cent – very, very strong market. It’s very, very strong rises, particularly in a lower inflationary market. 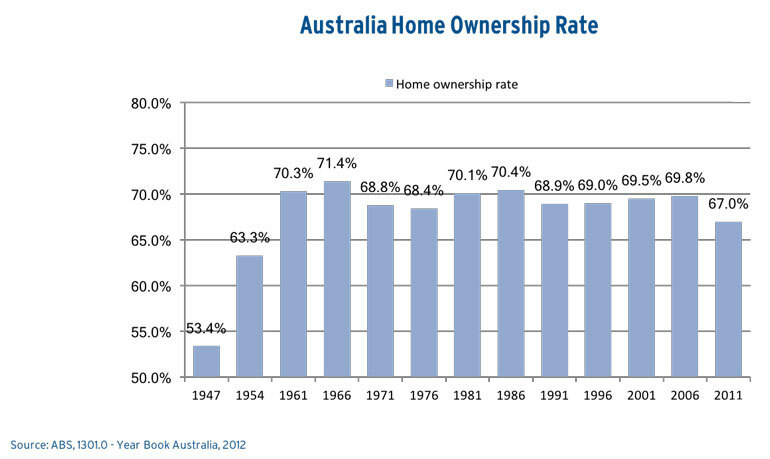 Home ownership rates. I was listening to news radio last week and they came out and said “home ownership rates are falling to 50 per cent”. I had to look at the Census data – it is not showing this at all. Now, fair call. Perhaps we need to break it up by age. Have a look and see what is happening with the under-35s. And I looked at that ABS data and I think it showed a rate of 39 per cent for home ownership. There was a slight slip from 41 per cent but here are the overall numbers. Just note that back in 1947 in the Menzies era – they only had 53 per cent. We are doing okay. I think when we see the 2016 numbers come out, it may record a decline but note those housing finance approvals numbers driven by owner-occupation, potentially the numbers may come in the same. And also note, finally, we are all living longer and those that are older, seniors, well they generally do own their homes outright. Stamp duty, one of my bug bears. Bracket creep. It’s real. It’s happening. Here’s some numbers from 2007 – 10 years ago. Sydney: the median house price then – $505,000. Now we’ve got $1,150,000. 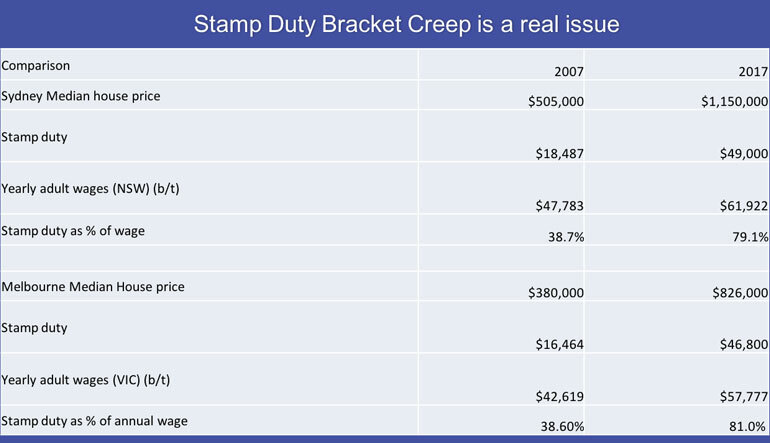 The stamp duty you would pay 10 years ago on a median house was $18,000. Now it’s $49,000. Stamp duty as a percentage of the wage, back in 2007, was 38 per cent. Now it is 79 per cent for Sydney, so rapid creep is alive and well. You can see the Melbourne numbers there. $380,000 back in 2007. Now we have it at $825,000 for a median house price. The stamp duty you would have paid 10 years ago on that type of price was $16,000. Now it’s $46,000, which represents 81 per cent of the average annual wage. We’ve got to do something about stamp duty. This is our forecast, which we put out each October/November. We put out a base case scenario and a scenario 2 and 3. 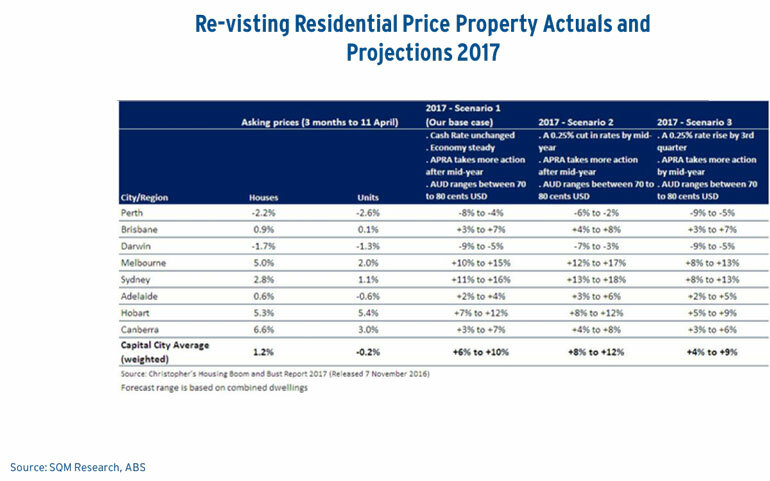 Our base case scenario is alive and well, which was the capital city average rises in prices for this year at 6-10 per cent, driven by Melbourne rising at 10-15 per cent and Sydney 11-16 per cent. And at this stage I see no reason to revise our forecast or move to another scenario. I think this is playing out. 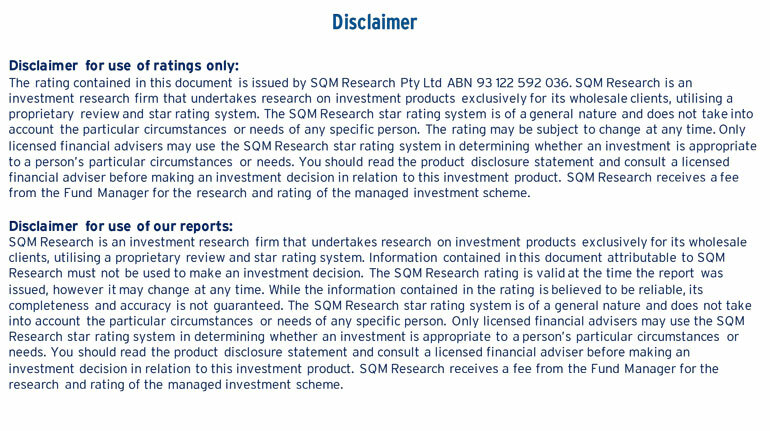 Now potentially we may well see [the Australian Prudential Regulation Authority] step into the market later this year. 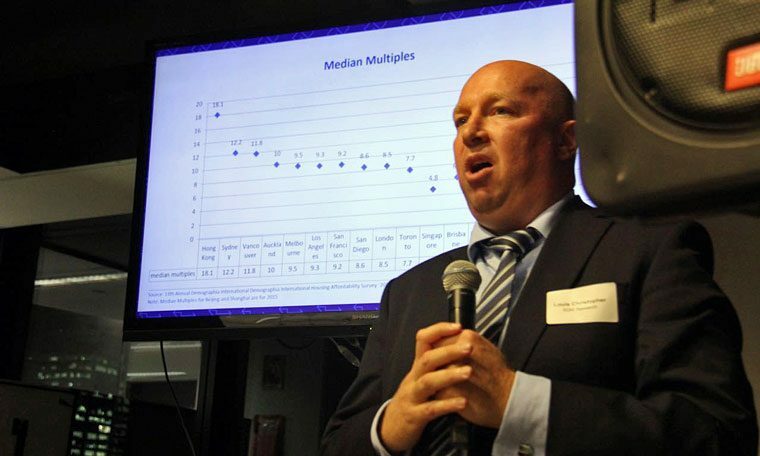 I think what will happen is APM and the ABS will actually record a year strong June quarter and there may well then be additional community pressure or government pressure for APRA to step in and take more drastic action – perhaps more aggressive action that could then trigger the slowdown.